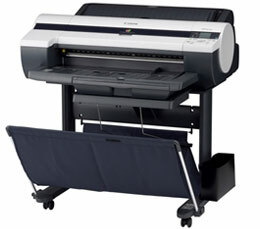 24″ large format printer. Produces vibrant full-bleed posters, clear text documents and crisp line drawings easily and quickly. The Canon iPF610 24″ large format printer produces vibrant full-bleed posters, clear text documents and crisp line drawings easily and quickly. Its 24″ output will impress clients and colleagues by communicating visual layouts with eye-catching color and exacting details. The Canon iPF610 features a Reactive Ink system consisting of four highly colorfast dye inks – Cyan, Magenta, Yellow and Black – plus two channels of pigment-based matte black. The new Canon iPF610 has a large LCD panel and operates with a reduced amount of noise, which means greater ease of operation and more flexibility in various environments. The Canon iPF610 provides both quality and performance, demanded by today’s market with the L-COA controller – the brain of the imagePROGRAF iPF series. The L-COA controller, alongside the 5-color Reactive Ink system, is designed to drive the best quality output at the highest possible speeds. The iPF610 has on-board support for HP-GL/2 and HP RTL files. It prints on a variety of media plus the inclusion of printing/application software programs provides the versatility and flexibility needed to be used in a wide variety of industries and applications, all in one captivating package. Don't buy Canon iPF610 without contacting Napco. Call us today at 1-866-752-6766.